The propaganda war on Syria now centres on Eastern Ghouta. In a rational world BBC coverage would be scorned by an intelligentsia priding itself on critical thinking. And in this one? It will be swallowed in its entirety, I fear, by most of said intelligentsia. Meanwhile, a few questions for the rest of us. Why would Assad want to ‘target civilians’ – as alleged yesterday on Radio 4’s World at One? How critical can we really be if, the moment our emotions are manipulated,1 we’re ready to accept allegations of comic book, evil-for-evil’s-sake villainy? Why is none of the coverage mentioning the proven fact the West wanted Assad out – for reasons nothing to do with his alleged brutality – long before the 2011 Daraa protests? Why was it OK to bomb Islamist terrorists in Mosul but not in Aleppo or Eastern Ghouta? Needless to say the Guardian2 has been as bad. This piece three days ago by Kareem Shaheen (granted safe passage last April by al-Nusra into and out of a Khan Sheikhoun the UN declared too unsafe for its chemical weapons team3) was never opened for comment. This editorial the next day was, but received such a kicking below-the-line it was closed for comment after just 137 responses – so much for ‘comment is free but facts sacred’! The other big scoring comments were very much in the same vein. It’s precisely at such times, when presented again with an ‘overwhelming’ case for ‘humanitarian’ intervention, that we most need level heads, critical faculties on red alert. In the face of a tidal force of insult and accusation of being apologists for torture and tyranny, we need not to keep our heads down, not to run for cover, not to join the graun chorus demanding that We – that’s a different ‘we’ – Do Something. Instead, those of integrity and rationality need to be up above the parapet and asking awkward questions. Heading the list, as ever, is cui bono? Who would gain from the ‘humanitarian’ ceasefire blocked by nasty Russia? The forces of an elected government, still fighting for survival after seven years of foreign backed terror our media mendaciously4 call a ‘civil war’ between ‘regime’ and ‘rebels’? Or an amalgam of jihadi groups bent on mediaevalising a state they loathe for its secularism, the West for its Ba’athist ‘arab communism’? What government in the world would tolerate the occupation of its sovereign territory – nay, a suburb a few miles from its capital – by hostile forces, cut throat fanatics of largely foreign origin? Why, for that matter, are these cut throat fanatics ‘rebels’ in Syria, Daesh terrorists in Iraq? What is the logical endgame of the constant demonising not only of Assad but Putin? And whose interests are served by it? It is very hard to write a letter to a country where children, women, and men are being bombed by “the coalition for the greater good”, so they say in the corporate media. How to find words while you are looking for your sons and daughters in the fire, explosions and collapsed buildings? But a letter from Slovenia to Syria must be sent. Dear Syria in Slovenia we have seen this before when Yugoslavia fell apart and a devastating carnage took place in a state where people used to sing about brotherhood and equality. We saw the refugees from ex Yugoslavia and felt their pain like we witnessed the suffering of many Syrian refugees. Do you know that ex Yugoslavia was bombed in the NATO operation called the “Merciful Angel”? What kind of mercy is that? Those children in ex Yugoslavia till this day suffer because of depleted uranium in those bombs. Our reality is Slovenia and in the South neighborhood countries is a direct consequence of that cruel war, where neo-imperial interests played a significant part. In ex Yugoslavia, they won. The vicious terminology is invented after us: to balkanize – divide (a region or body) into smaller mutually hostile states or groups. Balkan is their shopping mall now, ruled by the obedient government puppets, while many global corporations export their dirty industry into our countries and dictate our policies. That is precisely what they would like to do in Syria – to turn people against each other because of national, religious or political beliefs. Been there done that. It is never worth it if people must die! That is why they invented this “Assad must go” narrative because you should have a president that divides you, is a religious fanatic or an obedient puppet of neo-imperial masters. If not, they will invent brutal lies, trying to sell them as a heroic epic poem, like White helmets. Dear people of Syria, do not be divided and stay strong. Many of us in Slovenia believe you are the true heroes of our times. You did not allow your beautiful country to be amputated and served as a feast to never-ending neo-imperialist appetites. Oh, yes, some want to portray you as a “deranged” state that desperately needs a “lesson in democracy”. What a bloody joke! In Slovenia, we know and we contributed a massive body count in the 1st and 2nd World War that were monstrous affairs which both started in “the most civilized Christian” Europe. Dear Syria, may you be blessed with peace and freedom. With respect, love, and admiration from Slovenia. We’ve been here before. See this 89 second video on Aleppo’s last, last, last, last hospital struck for unfathomable reason by Russian/Syrian forces. 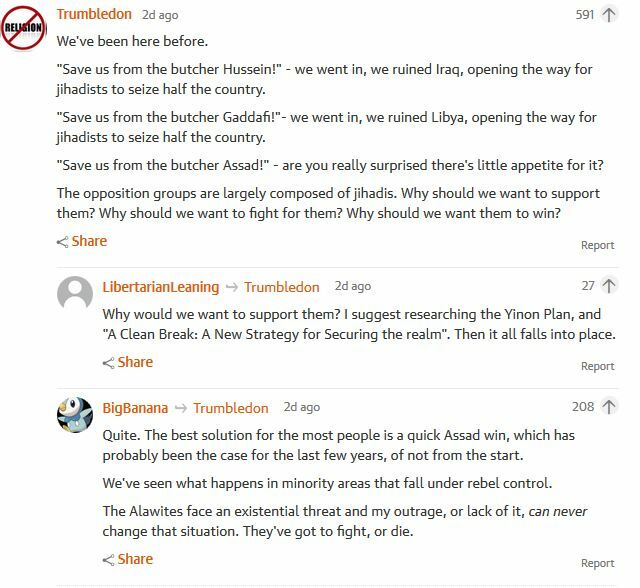 Readers may recall a scurrilous piece in the run up to Xmas, vilifying all doubters of White Helmet neutrality as Putinbots and Kremlin trolls.Two independent (note the lower case ‘i’) journalists singled out for abuse were Eva Bartlett and Vanessa Beeley, both of whom – unlike a single Guardian reporter – spend much of their time inside Syria, both of whom asked for and were denied right of reply. (When the Mail does that, Monbiot rightly calls it no-platforming.) 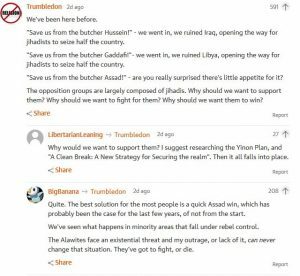 The current White Helmets leader, by contrast – a man refused entry to the USA on terrorist grounds – was yesterday given generous Graunspace to call for … Western intervention on Syria! Couldn’t make it up, could you? That WH mouthpiece was never opened for comment but Off-Guardian has plugged the gap here. I implore those new to thinking critically about Syria to read the OffGuardian comments. In a perfect example of the mass deception on Syria, ‘proof’ of Assad’s guilt at Khan Sheikhoun on April 4 2017 relies – the UN’s OPCW never having visited a crime scene deemed too dangerous – on ‘evidence’ collected by ‘rebels’ and shipped via Turkey. Yet all mainstream media commentators, with the honourable exception of rightwing maverick Peter Hitchens, have cheerfully and endlessly drilled into us that said guilt – no credible motive ever supplied – is beyond dispute. Sadly, many on the marxist left have happily echoed this and other kangaroo court verdicts. I don’t say all or even most reporters and editors are liars. I hold a more nuanced view of how media ownership and revenue streams serve, as does the machinery of the state, big money. See this interview of Noam Chomsky. It’s more than twenty years old but still entirely valid. « Liverpool fans: I’ll be a Muslim too!